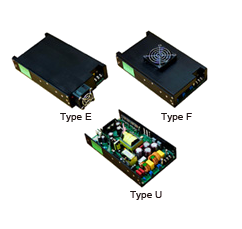 The PSPW500 series of AC/DC switching power supplies consists of U-chassis (U type), enclosed with rear-side built-in (E type), and enclosed with top-side built-in fan (F type) models. Built-in fan models offer 500W of output power and U-chassis models offer 360W of output power with convection cooling and 500W with 30CFM forced airflow. All units have a single output, 90~264VAC full range input, and active PFC. 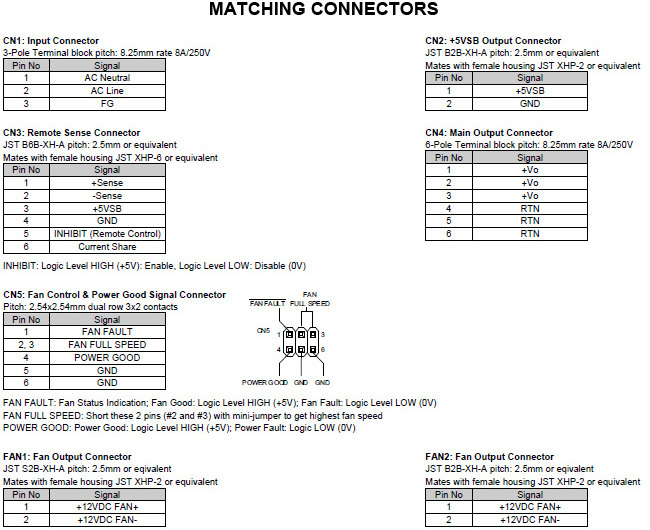 These supplies also have UL60601-1, TUV EN60601-1, CB IEC60601-1, and CE safety approvals. All models are protected against short circuit, over load, over voltage, and over temperature conditions. This series also has a current sharing option (suffix “D”). Notes: 1. 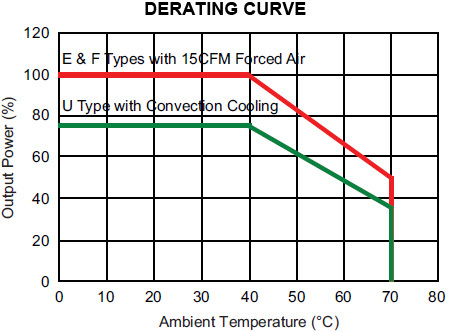 The output power and output current listed in the table on the "Models" tab is the maximum value with 30CFM forced airflow for U-Chassis models and 15CFM forced airflow for models with fans. 2. Mechanical Options: The “U” suffix in the model number is for U-chassis type, “E” is for enclosed type with rear-side built-in fan, “F” is for enclosed type with top-side built-in fan, and the “D” is for current sharing option. 3. U Type: 360W max. at +40°C ambient temp. and free air convection. 500W max. at +50°C ambient temp. and 30CFM forced air. E Type: 500W max. at +50°C ambient temperature. F Type: 500W max. at +50°C ambient temperature. 4. +5VSB/0.25A with convection cooling and +5VSB/1A with forced air cooling. 5. Preset accuracy should be less than 1% of nominal output voltage at 60% full load.